I don’t do a lot of guest posts so it seems a bit strange to have the 2nd one in two weeks. But there are good reasons. One is a local friend who needed help while on vacation (wait…help while on vacation…is that even possible?) and today I’m helping someone whose time and energy are focused on her family after her father-in-law had both a heart attack and a stroke. Times like this are when family priorities are a given and friends need to be there so Rachel, I’m honored you asked me to do a post for you and your blog. You just take care of you and your family. As I share on the post on Rachel’s site, I haven’t made meatloaf for a while now. Now that I’ve tried this updated version of a long time favorite I think I’ll be putting this on my menu more often. A bit of sweet and spicy using Mae Ploy Sweet Chilli Sauce made it a brand new recipe for me and it was a great update. It’s easy, it’s got a bit of spice and did I mention it was easy? I firmly believe that even the encouragement of strangers can uplift us when we need it most. I just wish I could deliver this to her in real life but I’m hoping that even this virtual effort will bring a measure of the comfort that meatloaf is synonymous with. An old-fashioned meat loaf updated with some bacon and a sweet/spicy sauce. Brown bacon in large skillet until browned, drain slices on paper towels, cool and crumble. Mix all ingredients including crumbled bacon together until just thoroughly combined. Do not over mix. Form into oval loaf shape approximately 6? X 10? rectangle and place on a metal cooling rack placed on top of a foil lined baking sheet. Bake until meat is cooked to 165 degrees internal temperature; approximately 1 hour. Remove the meat loaf from the oven, brush the top thoroughly with additional Mae Ploy sauce and return to the over for approximately 10 minutes or until internal temperature is 170 degrees. Let cool for 10-15 minutes before slicing and serving. I made it with Maggi Sweet Chili Sauce and it came out unbelievably good! (And didn’t even have the bacon, because I didn’t feel like dealing with the mess…) Has been added to my meatloaf favorites list. Thanks so much for sharing. You go girl. Mae Ploy is one of my favs! You are rubbing off on me? I love that stuff. that is truly a work of meatloaf art! Thank you very much for sharing! You made me seriously laugh out loud Adele…thanks so much. Now I’m wishing I actually still had some. This recipe may just help me get over my dislike of baked ground beef. I know my husband would love it if I did as I don’t know when I made a meatloaf last and he’d probably really enjoy one for dinner. I’m very sorry to hear about your friend’s father-in-law and going over to visit her now. Make it for the hubs and hoping you enjoy it for you! You’re a doll…and so is she. Thanks for stopping by Daisy. I’ll bet you it was a five year span for me. I can not let that happen again! That meatloaf looks anything but dry and boring! I truly think meatloaf is an underappreciated food – it is a favorite in our house and I’m definitely going to have to try this one! I think I’ve got more of these type of recipes I need to have resurface. Almost like I relegated them to ‘family’ food and when the girls moved into their own places I stopped making them. That must change! I’m madly in love with this meat loaf! For years, I’ve been making different variations of Flay’s meat loaf because it’s really pretty darn good, but I think this could become my new ‘go to’. Bacon and pepper sauce, fuhgeddaboutit! I’m so there! Uh oh…up against a Bobby Flay recipe? Fingers crossed and now off to find his. I’m sort of on a meatloaf kick after having this one. Want more! I don’t remember the last time I had meatloaf, but I did love it as a kid. Funny story… My father once sent me to school with a meatloaf sandwich, which is fine and all but he gave me a huge hunk of the stuff. I love meatloaf but my husband does not 🙁 So when he goes out of town – I’m making meatloaf! Funny that we both posted meatloaf recipes at the same time! Is Mai Pai Spicy Sauce a commercially available product? I don’t see a recipe for it here, but when I Google for it, I don’t find anything about it. That is because I am an idiot. Or I would prefer to think because I finished this post WAY too late and totally forgot to check the name on the bottle? Yeah…that’s it. 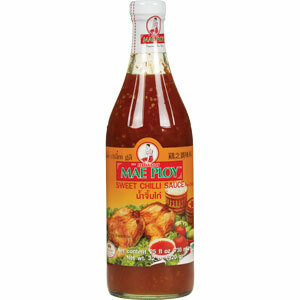 Try Mae Ploy Sweet Chilli (yes that IS the correct spelling) sauce. I even Googled it looking for a photo of the bottle and couldn’t find it! You would think that ‘might’ have been enough for me, no matter how late I was finishing this, to have triggered that it was wrong, huh? 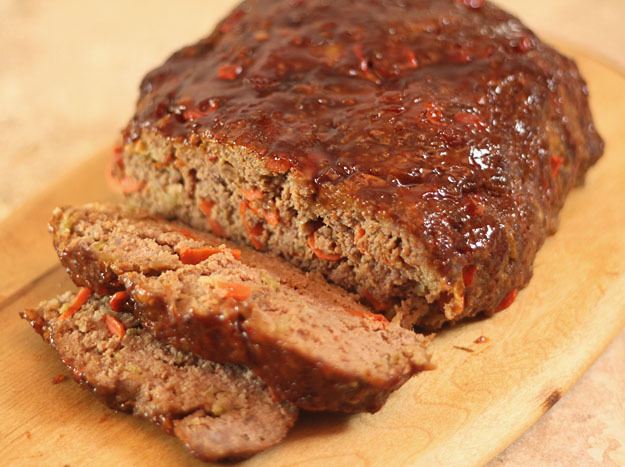 There seems to be a meatloaf conspiracy going on… I grew up having to force down my mom’s bland, dry meatloaf and swore off the stuff as soon as I hit adulthood. Ugh! Now this is the second meatloaf I have seen on a blog today that would actually get me eating it! Looks delish and the sweet and spicy sauce has my name written all over it! Delicious! This is not bland or dry and even if it were…that meatloaf sandwich has mayo remember. Gee I LOVE them.